Quercus phellos var. obtusifolia Lam. Quercus virginiana var. eximea Sarg. Quercus virginiana var. virescens Sarg. This profusion of common names partly reflects an ongoing controversy about the classification of various live oaks, in particular its near relatives among the white oaks (Quercus subgenus Quercus, section Quercus). Some authors recognize as distinct species the forms others consider to be varieties of Quercus virginiana. Notably, the following two taxa, treated as species in the Flora of North America, are treated as varieties of southern live oak by the United States Forest Service: the escarpment live oak, Quercus fusiformis (Q. virginiana var. fusiformis) and the sand live oak, Quercus geminata (Q. virginiana var. geminata). Matters are further complicated by southern live oaks hybridizing with both of the above two species, and also with the dwarf live oak (Q. minima), swamp white oak (Q. bicolor), Durand oak (Q. durandii), overcup oak (Q. lyrata), bur oak (Q. macrocarpa), and post oak (Q. stellata). Live oak can be found in the wild growing and reproducing on the lower coastal plain of the Gulf of Mexico and lower East Coast of the United States. Its native range begins in southeast Virginia, and then continues south in a narrow band along the coast to the interior South Carolina coast, where its range begins to expand farther inland. 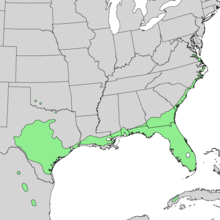 The range of live oak continues to expand inland as it moves south, growing across southern Georgia and covering all of Florida south to the northernmost Florida Keys. Live oak grows along the Florida panhandle to Mobile Bay, then westward across the southernmost two tiers of counties in Mississippi. Live oak grows across the southern third of Louisiana, except for some barrier islands and scattered parts of the most southern parishes. Live oak’s range continues into Texas and narrows to hug the coast until just past Port Lavaca, Texas. The species reaches its northwestern limit in the granite massifs and canyons in Southwestern Oklahoma, a rare remnant from the last glaciation. Along the coastal plain of the Gulf of Mexico and south Atlantic United States, live oak is found in both single and mixed species forests, dotting the savannas, and as occasional clumps in the grasslands along the lower coastal plain. Live oak grows in soils ranging from heavy textures (clay loams), to sands with layers of organic materials or fine particles. Live oak can be found dominating some maritime forests, especially where fire periodicity and duration are limited. Live oak is found on higher topographic sites as well as hammocks in marshes and swamps. In general, southern live oak hugs the coastline and is rarely found more than 300 feet above sea level. Live oaks grow across a wide range of sites with many moisture regimes – ranging from dry to moist. Live oak will survive well on both dry sites and in wet areas, effectively handling short duration flooding if water is moving and drainage is good. Good soil drainage is a key resource component for sustained live oak growth. Required precipitation range is 40-65 inches of water per year, preferably in spring and summer. Soil is usually acidic, ranging between pH of 5.5 and 6.5. A live oak on Tyler Avenue in Annapolis, Maryland is the northernmost known mature specimen, although a number of saplings can be found growing around nearby Towson. The avenue of live oaks at Boone Hall in Mount Pleasant, South Carolina, planted in 1743. A specimen at the former Protestant Children's Home in Mobile, Alabama. It has a trunk circumference of 23 feet (7.0 m), height of 63 feet (19 m) and limb spread of 141 feet (43 m). Depending on the growing conditions, live oaks vary from a shrub-size to large and spreading tree-size: typical open-grown trees reach 20 meters (65.5 feet) in height, with a limb spread of nearly 27 meters (88.5 feet). Their lower limbs often sweep down towards the ground before curving up again. They can grow at severe angles, and Native Americans used to bend saplings over so that they would grow at extreme angles, to serve as trail markers. The branches frequently support other plant species such as rounded clumps of ball moss (Tillandsia recurvata), thick drapings of Spanish moss (Tillandsia usneoides), resurrection fern (Pleopeltis polypodioides), and parasitic mistletoe. Southern live oak is cultivated in warmer climates as a specimen tree or for shade in the southern United States (zone 8 and south), Nuevo León and Tamaulipas states in Mexico, and in the warmer parts of the United States, Europe, and Australia. Cultivation is relatively simple, as Southern live oak seedlings grow fast with ample soil moisture. After a few years live oak needs only occasional supplemental water. Southern live oak is very long lived, and there are many specimens that are more than 400 years old in the deep southern United States. The Angel Oak on Johns Island, South Carolina. The man standing under the tree is 5 feet 11 inches (1.80 m) tall. The Seven Sisters Oak, estimated to be as old as 1,500 years, is the largest certified southern live oak tree. The Big Tree is an estimated 1,000-year-old southern live oak located in Rockport, Texas, the largest live oak in Texas. The Cellon Oak, with a circumference 30 feet (9.1 m), a height of 85 feet (25.9 m), and an average crown spread of 160 feet (48.8 m), is the largest recorded live oak tree in Florida. It is used as the logo of Alachua County, Florida. 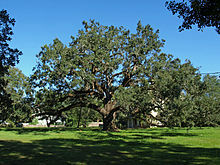 The Emancipation Oak, on the campus of Hampton University in Virginia, is listed as one of the "Ten Great Trees of the World" by the National Geographic Society. The Friendship Oak is a 500-year-old southern live oak located on the Gulf Park campus of the University of Southern Mississippi in Long Beach, Mississippi. The Lover's Oak in Brunswick, Georgia, is estimated to be 900 years old. The Bland Oak in Sydney, Australia, is one the oldest trees in the city and the largest oak tree in the country, planted in the 1840's by inventor and politician William Bland. 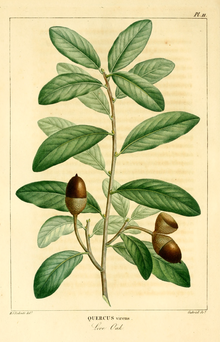 ^ Q. virginiana was first described and published in the Gardeners Dictionary, Edition 8. London. Quercus no. 16. 1768. "Plant Name Details for Quercus virginiana". International Plant Names Index (IPNI). International Organization for Plant Information (IOPI). Retrieved July 19, 2010. ^ "Quercus virginiana Mill.". World Checklist of Selected Plant Families (WCSP). Royal Botanic Gardens, Kew – via The Plant List. ^ Bender, Steve, ed. (January 2004). "Quercus virginiana". The Southern Living Garden Book (2nd ed.). Birmingham, Alabama: Oxmoor House. ISBN 978-0-376-03910-1. ^ a b Nixon, Kevin C. (1997). "Quercus virginiana". In Flora of North America Editorial Committee (ed.). Flora of North America North of Mexico (FNA). 3. New York and Oxford. Retrieved 2008-11-01 – via eFloras.org, Missouri Botanical Garden, St. Louis, MO & Harvard University Herbaria, Cambridge, MA. ^ "Live oak dropping leaves in early spring". Texas A&M AgriLife Extension. Texas A&M University. 2010-09-08. Retrieved April 14, 2015. ^ "Quercus virginiana: Southern Live Oak". University of Florida IFAS Extension. University of Florida. Retrieved August 8, 2013. ^ "Selecting Tropical and Subtropical Tree Species For Wind Resistance" (PDF). University of Florida IFAS Extension. University of Florida. Retrieved November 13, 2012. ^ "Quercus virginiana Mill. live oak". Natural Resources Conservation Service. US Department of Agriculture. Retrieved August 8, 2013. ^ "Landowner Fact Sheets - live oak Quercus virginiana". Virginia Tech Dendrology. Virginia Tech College of Natural Resources and Environment. Retrieved 27 September 2018. ^ John C. Gifford (1946). "Some Reflections on the Florida of Long Ago" (PDF). Tequesta: The Journal of the Historical Association of Southern Florida. University of Miami (6): 42. Retrieved 27 September 2018. ^ "History of the Angel Oak". ^ Sledge, John S. (1982). Cities of Silence. Tuscaloosa, Alabama: University of Alabama Press. pp. 15, 19. ISBN 978-0-8173-1140-7. ^ Pruitt, Paul M.; Higgins, Robert Bond (1963). "Crime and Punishment in Antebellum Mobile: The Long Story of Charles R. S. Boyington". Gulf Coast Historical Review. 11 (Spring 1996): 6–40. ^ Borland, Timothy (July 22, 2011). "Treehugger 4: Duffie Live Oak". Mobile Bay Magazine. PMT Publishing. Archived from the original on May 12, 2014. Retrieved November 13, 2012. ^ Owen, Sue. "Find Pushes Century Tree's Planting Back To 125 Years Ago". www.aggienetwork.com. Retrieved 2018-06-03. ^ "Century Tree". Famous Trees of Texas. Texus A&M Forest Service. Retrieved 2018-06-03. Wikimedia Commons has media related to Quercus virginiana.